I came across this "article" [blog] last night and it really sat uneasy with me....Here's the blog first and then I'll rant afterwards. "Have you noticed a recent surge in Asian men and white women being together lately? 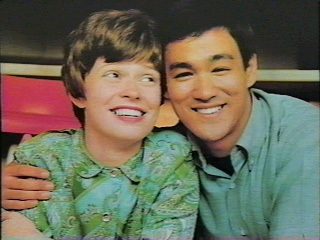 Bruce Lee and Linda Lee Caldwell were one of Hollywood’s first Asian man/Caucasian women celebrity couples … and that was in the 60s! So what’s changed? The question is, why is this interracial combo not as widespread as other interracial combos? There is definitely a higher percentage of Asian women with white men than ever before. Why? The above video [I took it out - visit the website to view video] was taken by video crew who asked random and predominantly Asian guys and girls “Why Asian girls are attracted to white guys”. Stereotype… stereotype and more stereotype! According to this video, most respondents described Asian men as being too shy or unassertive. The woman also stated Asian men were too effeminate and even too short! Apparently this is turning Asian women away and they are beginning to look elsewhere. Asian stereotypes have been created by society in general. Enough articles have been written about what I would like to call stereotypical racism in the Asian community – for instance, how Caucasian men actively seek an Asian woman because of their exotic looks and supposed submissivenes?. How many have this so called Asian fetish or yellow fever? Asian females, on the other hand, have constantly been disgraced and labeled “white-washed” women busy trying to climb the social ladder by their own communities and are finding more acceptance with races other than their own. So what about the rise of interracial relationships between the Asian man and Caucasian woman? Is it that Asian men are fed up with their female counterparts and that they take revenge by dating Caucasian women? (just a thought) Or just that there are fewer Asian females in their dating pool so they are expanding their own horizons? My conclusion is that maybe it’s not that at all. I think people should be intelligent enough not to allow trivial stereotypes to conform to their preferences on who to date. Why do you think there is a rise in the Asian man-Caucasian woman interracial combo?" First, I think I need to remind the author that the title of this article and the first sentence point that he is going to discuss Asian men-Caucasian women relationships....but instead talks about Asian women and Caucasian men....not the same....yes, same cultural/ethnic combination but he didn't go into the article saying we're going to discuss the rise of Asian-Caucasian relationships. Next, why does there have to be a reason other than people are finally becoming more accepting to the concept behind interracial relationship? That we're in a place today where people fall in love with a person and not a race? Why does it always come down to a fetish or rebellion? People forget that it hasn't been that long (historically speaking) that interracial marriages have been allowed in the United States....only 44 years. Think about it. How many of us have parents older than 44? Or maybe it's because I'm dating a man who identifies as Asian-American (a child of an interracial marriage) but it angers me to think that people want to discover a sociological reason behind our relationship. Does there have to be some underlining psychologically repressed reason for us being attracted to the other? Can't it just be because we love each other?